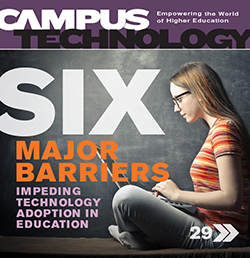 Experts identify the most substantial tech-related obstacles to education. Finding your own "unicorn" and other ways to create healthier relationships between academia and the IT department. One expert believes that the unbundled approach of competency-based education could destroy all but a handful of colleges and universities. Creating a physical hub of innovation on campus can support creativity, collaboration and entrepreneurship. While technical expertise definitely has its place in higher education, increasingly IT departments need to sharpen other kinds of skills to succeed. When Trinity U built a new Center for Sciences and Innovation, it included a 10,000-square-foot area that lends itself to interdisciplinary collaboration.